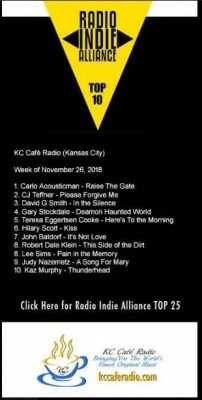 Don’t Call Me Angel continues to make the top ten in KC Cafe’s reports to Radio Indie Alliance! Hilary Scott’s track “Kiss” was number 6 the week of November 26th. Thank you KC Cafe’ Radio!!! at #36 on November 4th, and moved up to #35 the next week.